Massa. Mag. / The President of the United States. Published in: The Massachusetts Magazine (Boston: Thomas and Andrews, March 1791). 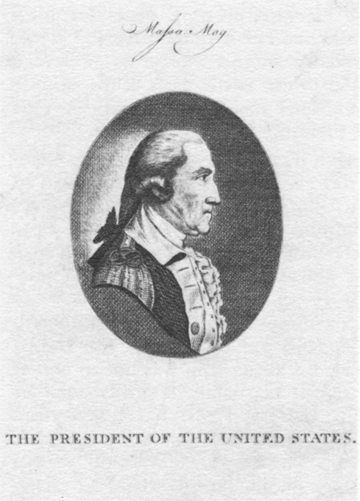 Notes: Isaiah Thomas and Ebenezer T. Andrews, who began publishing Massachusetts Magazine in January 1789, used this engraving to illustrate an early biographical sketch of George Washington by John Bell. They made a practice of including an engraved illustration in each issue of the magazine and, because many of them were the work of Samuel Hill (c. 1765-c. 1809), he may have produced this one.